3/21/2011Share this story on Facebook! Ithaca College ensembles tour nationally and internationally. Here are some recent trips. Norfolk, Virginia, 2011: The wind ensemble performed at the 77th Annual Convention of the American Bandmasters Association. Philadelphia, 2010: The women’s chorale presented a program entitled “We the People” at the First Baptist Church as part of the American Choral Directors’ Association Eastern Division Conference. St. Petersburg, Russia, 2008: The contemporary ensemble (then called Kulmusik) performed at the 20th International New Music Festival, “Sound Ways.” The concert took place at Glinka Hall of the Philharmonic, one of St. Petersburg’s most beautiful and prestigious halls. 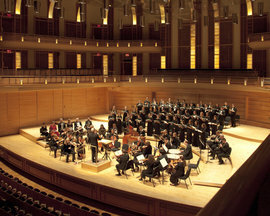 New York City, 2008: Students from the choir, chorus, women’s chorale, and symphony orchestra performed Verdi’s Requiem at Lincoln Center’s Avery Fisher Hall. Ireland, 2007: The wind ensemble presented the music of Copland, Bennett, Grantham, Lauridsen, and Sousa to audiences in Dublin, Cork, Limerick, and Clonmel. New York City, 2005: The choral union and symphony orchestra performed Carl Orff’s Carmina Burana at Lincoln Center’s Avery Fisher Hall. The moment before a conductor’s downbeat is one of the most exciting in any musician’s day. In that instant, you experience the synthesis of many hours of rehearsal, new relationships, and untold amounts of knowledge gained. Imagine this energy at a performance of one of the most epic pieces of classical music ever written. Imagine it taking place in the venue where the Baltimore Symphony Orchestra regularly performs, or in one of the oldest churches in the United States. This is how I felt when the Ithaca College Choir, joined by a combined student-faculty orchestra and faculty voice soloists, went on tour to Washington, D.C., and Philadelphia to perform J.S. Bach’s Mass in B Minor this past October. We arrived at the Strathmore Center for Music in Bethesda, Maryland, eight hours after our departure from Ithaca. The massive and beautiful space immediately inspired us. Performing the B minor mass at Strathmore made me feel that we were a part of something bigger than ourselves. From the more active sections to the slower, more intimate sections, the dramatic arc that we created as an ensemble was incredible and unlike anything I had experienced before. What elevated these performances was the collaboration between the student musicians and the professors. One such moment came when our concertmaster, Professor Susan Waterbury, made the difficult decision to leave the stage during the first half due to illness. Her student, violinist Natalie Brandt ’10, took over for her, right before one of the most difficult movements in the piece for the first violin. Ithaca College president Thomas Rochon, who was in the audience that night, later remarked that, after a moment of hesitation, Natalie played with the grace and technicality of a professional. Performing a piece such as the B minor mass takes a tremendous amount of concentration. I, and my fellow musicians, had to keep this intense level of focus for two hours. It’s difficult, but getting through it successfully is an amazing feeling. Our next performance took us to the Church of the Holy Trinity in Philadelphia’s Rittenhouse Square, but not before we made one brief but memorable stop. The Philadelphia Boys Choir performed an arrangement of “America” for us that they were going tosing that night at the National League championship series game between the Philadelphia Phillies and the San Francisco Giants. To say that we were amazed would be an understatement— the group was simply one of the best choirs we had ever heard. It is moments like these that make music one of the most rewarding occupations I can imagine. Performing at Holy Trinity felt very different—the church was large but more intimate, making it better acoustically. But because of other events being held there before our concert, we had less than an hour to spot-check the entire piece. This, even by professional standards, is not a lot of time. Still, our performance was even better than the concert at Strathmore. It was the first time that we truly expressed our emotional attachment to the music, which may have had something to do with the venue—there’s just something about a mass being performed in a church. As a vocal performance major, I’ve been on three School of Music tours, including this one, and the bus ride home always reflects what was experienced on the trip. After we took Ralph Vaughan Williams’s Dona Nobis Pacem to Atlanta and the Carolinas, the general sentiment was very introspective. After we performed Carl Orff’s Carmina Burana in the Northeast, the energy level was so high that I thought the bus might explode. On this bus ride home, there was a quiet energy among my fellow students and even the professors, as if we had passed a major mark in our musical and professional development. It felt like we had grown up, even slightly, into the musicians we aspire to be.